I've got to be honest, I have the post wedding blues. I loved every minute of the ceremony Saturday morning and have watched replays of several moments of the ceremony many times since Saturday morning. And I'm feeling a little blue that it's over! I remember getting up early and watching Diana and Charles' wedding with my mom in 1981; I spent the night with some girlfriends and we got up to watch Kate and William's wedding 7 years ago and this past Saturday, Terry got up and joined me for the watching of Meghan and Harry's wedding. I was moved by the choir singing ‘Stand by Me'…guessing that is Meghan and Harry's theme song and it's a good one. This song, as sung by this soprano, was divine for her procession into the church. How about those floral archways throughout?! Stunning! Her dress! What a classic! That they held hands almost throughout the entire ceremony! One month from today…believe or not…is the first day of summer! Yikes! How about some summer recipes? Surely, hamburgers will be on your summer recipe list. Can't make them without our favorite hamburger seasoning. Hmmm…I don't use sponges or loofahs, but probably need to be more mindful of my pillows. Love this idea to spiff up a faux leather purse! This tutorial has given me to motivation to try to do this build myself! 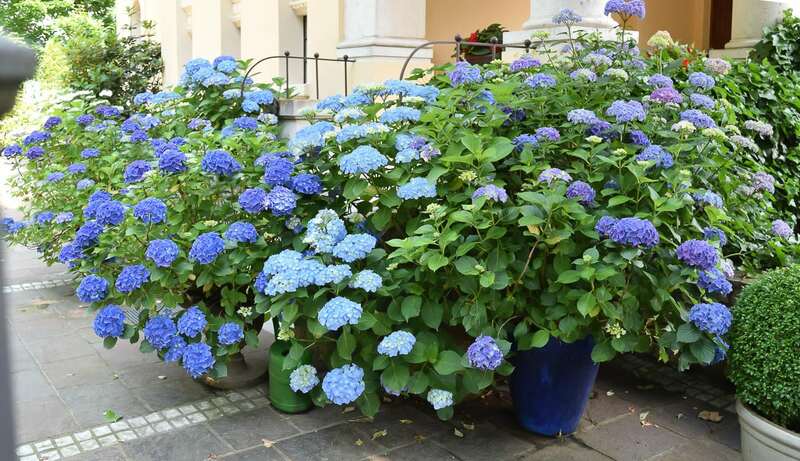 Ever since I saw all these pots of hydrangeas when we were hiking through Austria, I have had in the back of my mind to do the same at home. If this doesn't sound delightful, I don't know what does! Which cut flowers last longest! Finally, would love some input! I need a really good…very utiliarian…lots of organizing pockets and space…travel bag. One that would be a good carry-on. I'll still use my suitcase, but we are doing a good deal of travel this summer and I will spending lots of time on planes and in airports and need something that will efficiently and effectively carry all the stuff I like to travel with. Any suggestions? Thanks in Advance. Happy Beautiful Monday my friends! May your week be filled with all good things. If you find a travel bag you’d recommend, I’d love to hear about it. I still haven’t found one I’m happy with. Will do Laura…I picked one up at Marshall’s this week and I think it’s going to work out well. I’ll keep you posted.